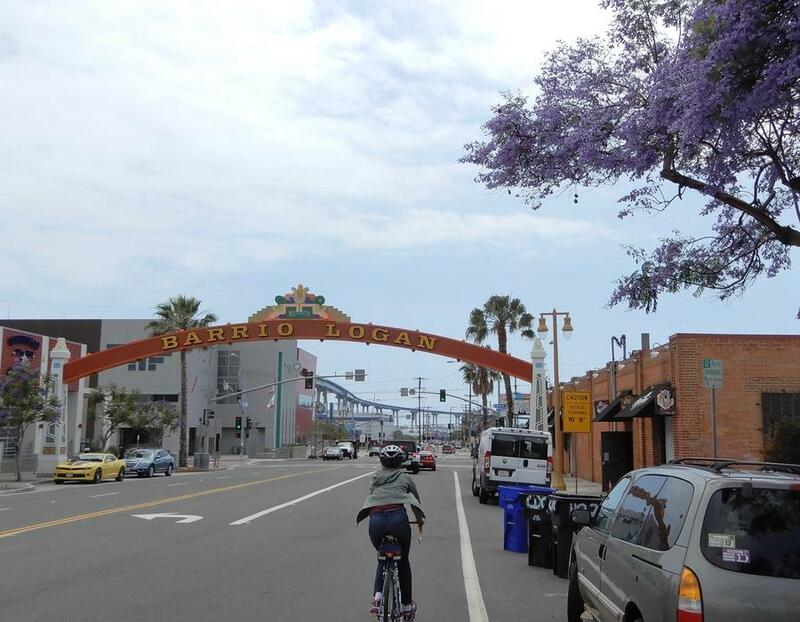 Beginning at our downtown cultural center, the Gaslamp Quarter and waterfront, we make our way to Midtown to recall a piece of WWII history before visiting to Old Town. 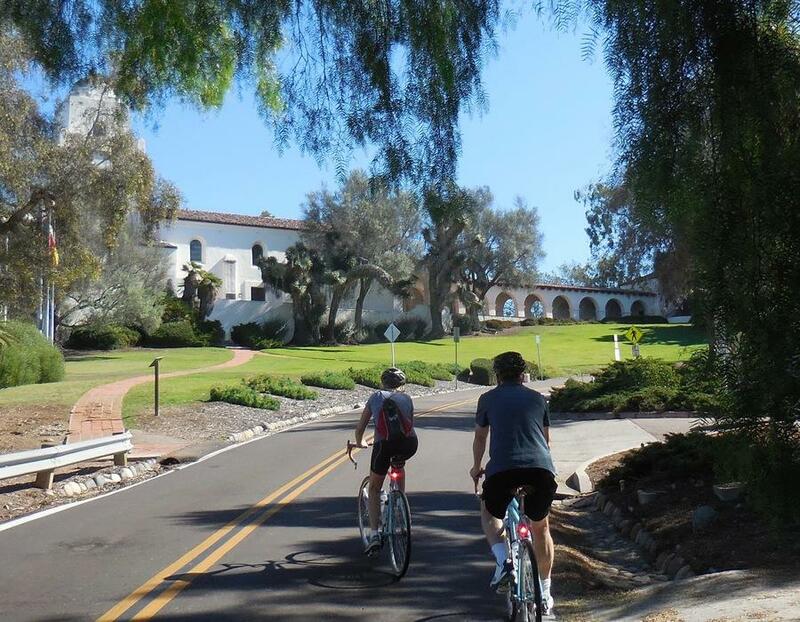 At Old Town State Historic Park we ride through the Spanish era Presidio Park, Mission Hills and Bankers Hill neighborhoods leading us to San Diego's cultural gem, Balboa Park. We'll meander through and around the Park before heading to South Park, Barrio Logan, and back to our start at the Gaslamp Quarter. "My husband and I had the BEST time on our tour with Tony! We rode the Heart of San Diego trip, and saw so much more than would have been possible on our own. Tony's bikes are in excellent condition, and he takes the time to make sure they fit you before the ride. I wish my bike was as comfortable as his was. 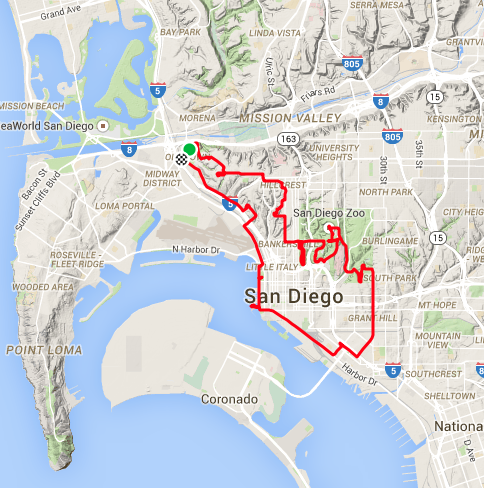 Next time I am in San Diego, I plan on taking another bike tour with Tony. I highly recommend joining him for an interesting morning ride!" Our most culturally informative tour. 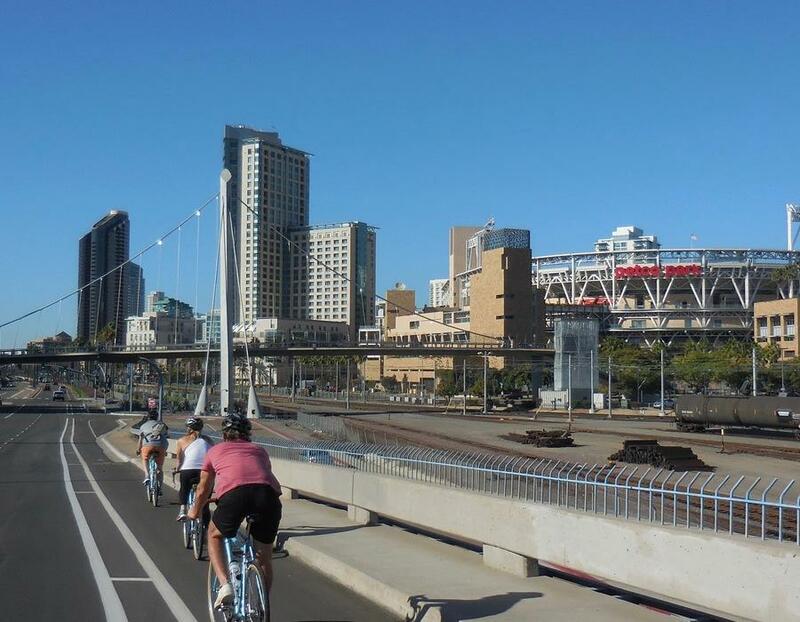 Ride through the heart of San Diego and see the historical origins and cultural hotspots of yesterday and today. Starting in the Gaslamp Quarter, our nightlife hotspot, we'll either ride through or around Petco Park, home to the San Diego Padres, the San Diego Convention Center, center stage for the annual Comic Con meet up, and the downtown waterfront home to; Seaport Village, San Diego’s tuna fleet, the USS Midway and more. Going north along the waterfront we'll visit the County Administration building water park before a challenging climb up Sassafras Street to a Midtown neighborhood for a view of WWII history and more. Then off to Old Town San Diego for a close up of San Diego circa 1870. From Old Town we climb to Presidio Park and a piece of Americana. And with a bit more climbing we reach historic Mission Hills neighborhood followed by Bankers Hill and the Spruce Street Suspension Bridge. 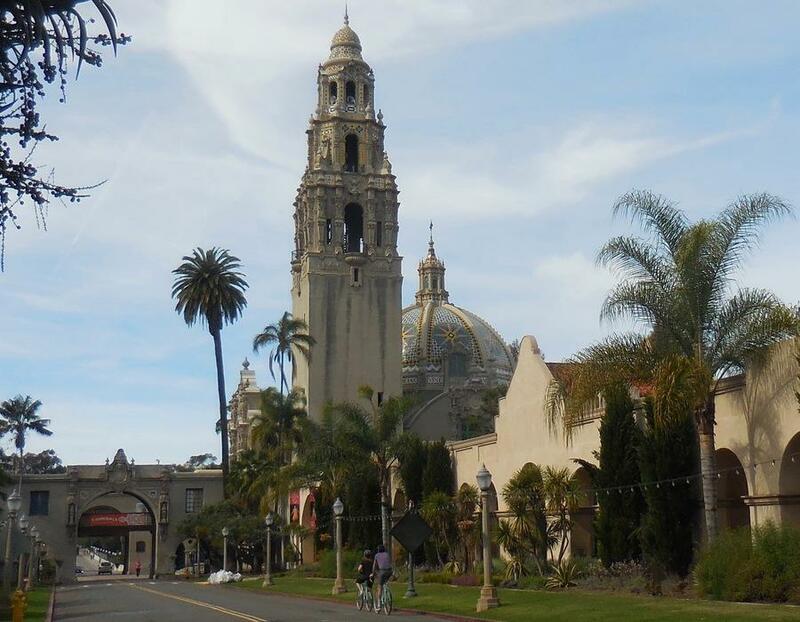 Next up, Balboa Park and a six mile saunter to visit a large portion of the Park, its history, and attractions. Leaving here we touch a corner of South Park’s eclectic lifestyle before parading through the center of Barrio Logan’s strong Hispanic culture and a short rise in the road returning us back to the Gaslamp. Some climbing its unavoidable on this route; and while the hills are steep, they are also brief. So good general fitness is needed to be able to complete this ride. The ride is technical in that it has several turns, some steep descents and we ride on roads with traffic. Most of the roads are in good condition, and we do cross train tracks on a few occasions. This tour has more history, sights, and vistas per-mile than any other tour, so it tends to go slow. If you’re looking for a fast pace or open road ride, this is not the tour for you. This ride is for a regular rider or someone with good fitness who wants to travel through San Diego’s rich history and current culture. Two short steep climbs in Midtown followed by a visit to Old Town before another climb to Presidio Park, Mission Hills, Banker's Hill and the Spruce Street Suspension Bridge. 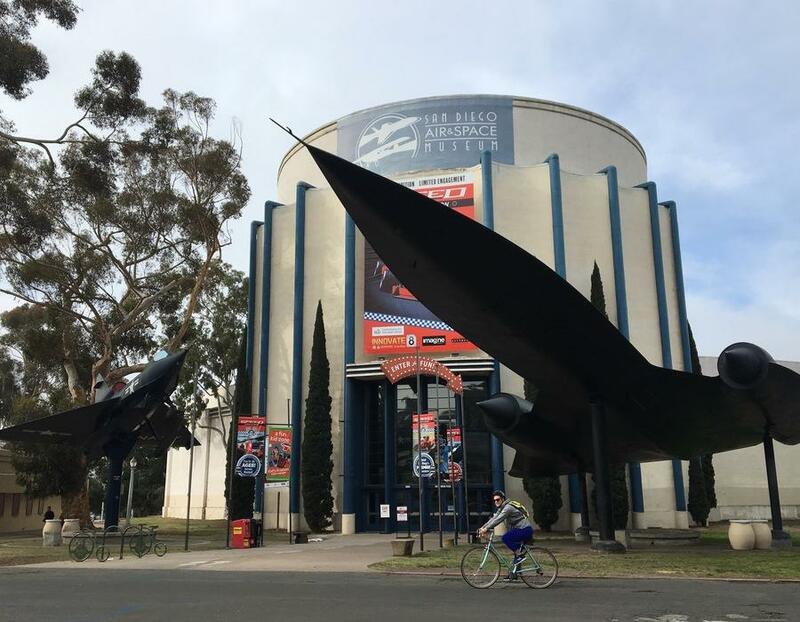 A meander through Balboa Park, followed by a moderate climb to South Park, before gliding downhill into Barrio Logan and then back to Gaslamp Quarter. This ride works well with an early to mid morning start time. There's an easy coffee stop in Mission Hills and another in Barrio Logan unless we choose Barrio Logan for a Mexican food lunch. We will stop along the the route for water and restrooms as needed. Variations to the route are possible to shorten the ride if needed.